HEB Scorpions up for the cup! 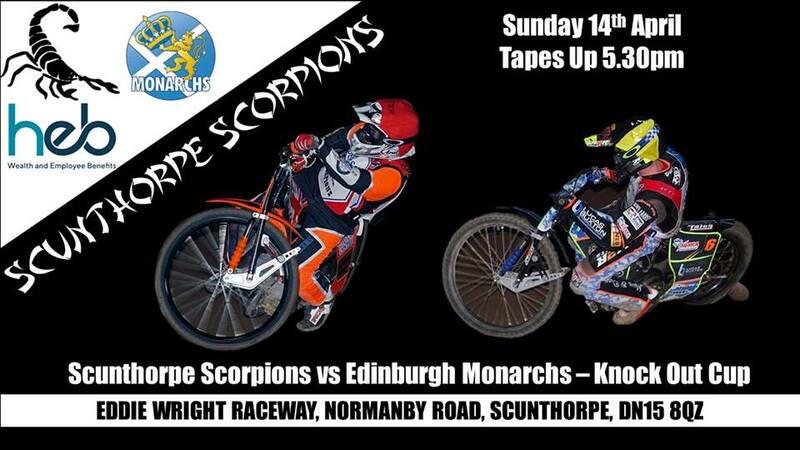 HEB Scunthorpe Scorpions are looking to build up a healthy advantage when they host the Edinburgh Monarchs in the first leg of a Championship Knockout Cup tie at the Eddie Wright Raceway this evening (Sunday, 5.30pm). Scorpions reached the final of the competition for the first time in 2018, and they are looking to go one better this season. New signing Danny Ayres is set to make his debut for the club, in place of Australian Jedd List. Scunthorpe promoter Rob Godfrey said: “Every point counts in the cup, because the more points that we can score at the Eddie Wright Raceway, the more chance that we have of progressing on aggregate. “It’s one reason that we needed Danny Ayres in, as soon as this meeting, because I’m sure we can expect him to score some points. He could make the difference for us if we want to be getting through to the next round. Jake Allen returns to action after pulling out at Leicester last Saturday after a crash in his opening ride. HEB Scunthorpe Scorpions: 1. Josh Auty, 2. Stefan Nielsen, 3. Jason Garrity (captain), 4. Danny Ayres, 5. Jake Allen, 6. Ryan Kinsley, 7. Josh Bailey. Edinburgh Monarchs: 1. Ricky Wells, 2. Justin Sedgmen, 3. Josh Pickering, 4. Joel Andersson, 5. Cameron Heeps, 6. William Lawson, 7. Luke Ruddick.